I’m a real ale drinker. Have been for ages and ages. Given the opportunity I’ll always pick an interesting local ale over a standard pint of something from the pump. I don’t know my wine or my whisky, couldn’t tell you the difference between a single malt and a blended. I’d need to be guided through what I was looking for, with a glass of each in either hand. I’m not going to claim to be an expert in real ale either, but I know what I like and don’t, so for a bit of variety amidst the writing and other posts, I thought I’d start doing some real ale posts. There are approximately 100 breweries in Yorkshire alone, so that’s a lot of pints and a lot of different ales to try, plus many of the breweries have seasonal ales, special ales, competition ales. So I don’t think I’m going to run out of things to dry and talk about, and that’s just on my doorstep, never mind nationwide. This traditional dark mild won the bronze medal at the SIBA Northern region beer competition 2010 as well as being voted the winner in its class at Bradford beer festival 2010. The blend of 5 malts used in the mash give a smooth, mellow easy to drink malt flavour with a hint of liquorices in the finish. I’m a fan of blonde pale ales, but I really really enjoy ruby and also dark ales that are not bitter or stout. Years ago in the Czech Republic I tried a delicious local beer called Kozel, which they’ve been brewing for about 130 years and it’s surprisingly light at about 4%. I think that was the first time I’d tried a dark beer and since then I’ve been seeking them out. 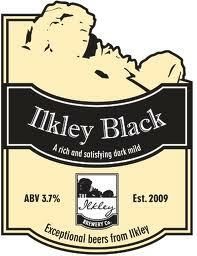 Ilkley Black is a really smooth drink. Barely a whisper of any bite and what there is leaves a small taste of liquorice in your mouth. To be clear, I’m not really much of a fan of liquorice, and yet I really enjoyed this pint, so the taste is very mild. Not too frothy, very little fizz, nice and chocolately and not at all bitter. In some ways it sorted of reminded me of salted caramels, if that makes any kind of sense. A real tasty ale. More information on all of Ilkley Brewery’s beers can be found here on their website, or you can order a wide variety of Yorkshire Ales from this special Yorkshire ale website and shop.